Very fun little series, reminds me of what rooster teeth did with rwby chibi. And i love all the call backs to the original series. The animation is nice and very adorable expressions as well as plenty of hilarious ones. Do reccomend if your looking for a good time killer or something to give you a good laugh. Far better than it needed to be! This is a clever and fun spinoff that helped to fill the time between the first and second seasons of Attack on Titan, and it was clearly made with care and attention to details. A bit of a warning, there are HEAVY spoilers throughout (even for things past Season 2 of the anime, references only manga readers would know about) so don't watch if you don't want to be spoiled a bit. Overall, I love the idea that there is another universe where all of these characters were alive and well, and their biggest problems were talking to crushes, grades, and avoiding having their lunch stolen by titan bullies. A good supplement to Attack on Titan, without the nervousness. It's nice being able to see the characters relax and enjoy regular life. The animators paid special attention to the chibi and maintained the identity of each character without sacrificing detail or relying too heavily on cliché. Watched the original Attack on Titan? 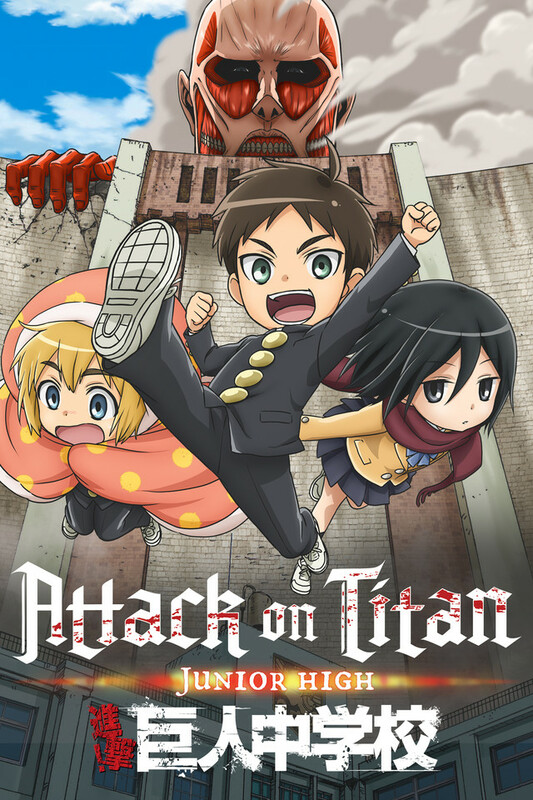 You'll love Attack on Titan Junior High! Filled with references any fan can catch, and humor that brings out our inner child. Bored out of your mind after just catching up with your favorite anime? Need a good show to just sit back and laugh? This is your show. The animation is a chibi style of the original, and all the voice actors have returned to reenact their previous roles and trust me, they do an incredible job. Yuki Kaji still captures Eren's aggressive attitude and Hiroshi Kamiya returns Levi's cold nature. And one of my favorite aspects of this show is the focus on side characters. Like Hanji, Sasha, Bertholdt, and Annie. Their personalities are really shown to the fullest. And don't get me wrong, the trio, sure enough, get their Showtime as well. So I would recommend this show to anyone wanting a laugh, trust me, you won't regret it. Hilarious and Yet Accurate Parody - MUST WATCH! This little anime is great! I absolutely recommend watching the original Attack on Titan series first - there are a ton of references to events that happen in it, and they ways they are tied in are extremely clever! Even though it is an absolute flip from the mood of the original, it still maintains a great energy and the short episodes make it a breeze to binge watch! Normally, I also cover what I didn't like about an anime here...but honestly, I thought this one was perfect just the way it is! I laughed during every single episode, and I loved the way the characters were able to interact here. It is a must watch! I love the spin they put on Attack on Titan Junior High while at the same time keeping the character in check. If you're a fan of Attack on Titan you'll enjoy this junior high version with it's cute and cuddly version. Each episode keeps you laughing as the intensity stays strong. Gotta love it. For a chibi anime version of the original anime they done a wonderful job keeping the flavor to it. Attack on Titan: Junior High - A Comedic Parody! When I first heard about Attack on Titan Junior High I didn't think I'd much care for it. Junior High type shows are not usually my cup of tea. But as a great admirer of the original series seeing the "kids" again in Junior High School was very refreshing. Not to mention hilarious. It's funny and comical in so many ways - straight out physical comedy, parody humor, and if you've seen even some of the origina lAttack on Titan little catchphrases or quirks of the characters are just hilarious. Very tongue in cheek, witty, with innuendo galore. All in all a very enjoyable series that provides some comic relief to its parent show where comedy was found, but along with the darkness and horror that was part of the original series, Attack on Titan. Attack on Titan Junior High gives you all comedy in many layers that makes it a fun series to watch. And of course a little bit of drama and romance as well. To enjoy it fully see at least the first season of the original series (the more the better) to understand the inside jokes and innuendo that Attack on Titan Junior High Provides. Its's a definite recommend on my list! Club watched the first episode of the series. Club ratings are 1-5 stars. Member 1 - Rated 3 out of 5 stars. Member 2 - Rated 4 out of 5 stars. Member 3 - Rated 2 out of 5 stars. Member 4 - Rated 5 out of 5 stars. Member 5 - Rated 1 out of 5 stars. Member 6 - Rated 3 out of 5 stars. Member 7 - Rated 1 out of 5 stars. Member 8 - Rated 4 out of 5 stars. Overall rating: 2.9 out of 5 stars. Club chose to move on to the next series on list rather than watch the second episode. Must have cheese Hamburg steak! If you enjoyed Attack on Titan, you will find this clever little show very entertaining. As dark and depressing as AoT can be, this series is light and funny. It pokes good natured fun at the original and each episode made me laugh. It's a quick watch so give it a try. But recommend you skip if you've never watched the original.